About - Who Killed Sister Cathy? 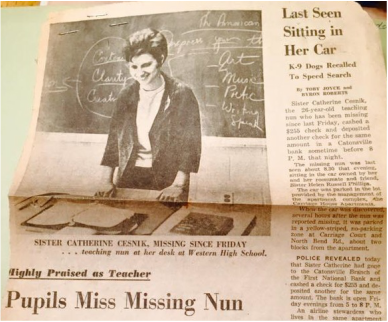 Sister Catherine Cesnik was a teacher at Archbishop Keough High School in Baltimore who was abducted and murdered on the night of November 7, 1969. Her body was found January 3, 1970. Around that same timeframe, Father A. Joseph Maskell, the chaplain at Keough was sexually abusing students. We do not know if there is a connection between the abuse and Sister Cathy's murder. Gemma Hoskins, Abbie Schaub & so many of their friends both old and new have dedicated countless hours of time and energy over the last few years and are so grateful for the recent outpouring of love and support! We haven't updated this site much since it was launched, but things are moving fast now so stay tuned for updates! Please feel free to send tips to them through our contact form, and sign up to volunteer here on this site. The Keepers - A documentary about this project is out now on Netflix https://www.netflix.com/title/80122179. The private facebook group is currently "paused" while we get caught up on all the exciting new tips that have come in since the documentary premiered. We're looking forward to getting it back up and running soon! We are a group consisting of Sister Cathy's students and friends who have always been haunted by her unsolved and violent death. We are getting older, and would like to know who hurt Cathy that night before our time runs out. We need information from people who lived through those times, who have knowledge of events on that Nov 7, 1969 night. We need help putting together a picture of the events swirling around Sister Cathy, information on anyone who had a motive to rob or harm her. We have a Facebook page "Justice for Catherine Cesnik and Joyce Malecki" to share ideas and information. If you prefer to remain anonymous the contact form this website does not require any identifying information from you.